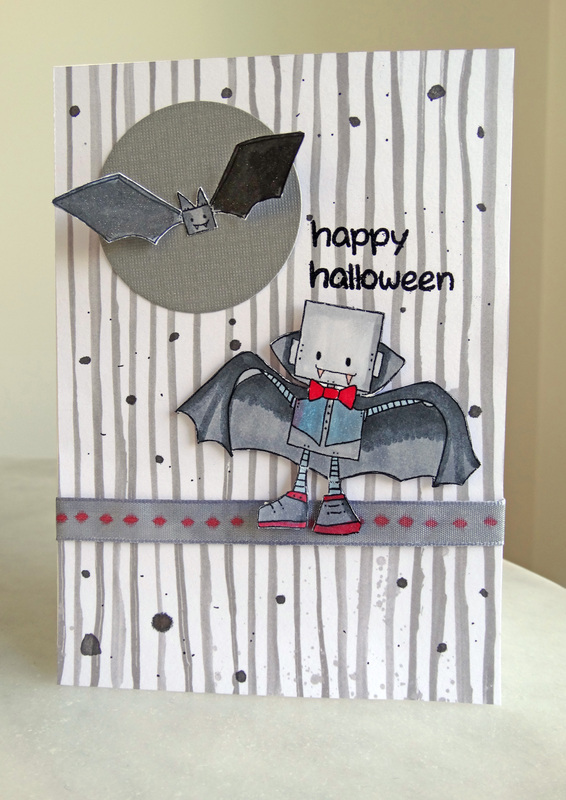 So I had another go at colouring this little halloween robot and bat and cut them out to use on a card for the OCC Day 8 homework. The background paper is from the Studio Calico Wanderlust 6×6 paper pad and I thought it looked a little like a birch forest background. My new Wink of Stella pens arrived last week, including a black one, so I decided to colour the bat wings. After I’d stuck it on the card of course. And without testing the pen on scrap paper first. Can you guess what happened? Yes it ‘blooped’ all over the card – a big splotch in fact and some little splatters. Well I just added some more splatters and cut out a bigger circle for the moon to cover the biggest splotch. So I’m also putting this card in the Mistakes gallery :). Oh, and I also used my Copics to colour some plain white taffeta ribbon which I used on the card – it didn’t need a heavy application and I think I can stop buying ribbon in every colour now!